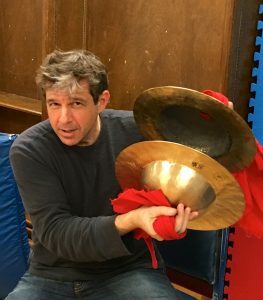 Described as a “genuinely American composer” by Gramophone, Anthony Paul De Ritis is Professor and former Chair of the Music Department at Northeastern University in Boston, and is jointly appointed in the Entrepreneurship and Innovation Group in Northeastern’s D’Amore-McKim School of Business. His music has been called “groundbreaking,” “ultra-exotic,” and “really cool,” and has received performances nationally and internationally, including at the Weill Recital Hall at Carnegie Hall, Merkin Hall, Le Poisson Rouge, Avery Fisher Hall at Lincoln Center, Harvard’s Sanders Theatre, Yale’s Woolsey Hall, Taipei’s Zhong Shan Hall, Beijing’s Yugong Yishan, Seoul’s KT Art Hall, the Italian Pavilion at the 2015 World Expo in Milan, and UNESCO headquarters in Paris. De Ritis’s CD Devolution, described as a “tour de force” by Gramophone, was released in June 2012 by the 6-time Grammy nominated Boston Modern Orchestra Project under the baton of Gil Rose, and was the WQXR Q2 “Album of the Week” for June 11, 2012. Devolution features three of De Ritis’s symphonic works, Chords of Dust, Legerdemain, and the work for which the CD is titled, Devolution: a Concerto for DJ and Symphony Orchestra, featuring Paul D. Miller aka DJ Spooky That Subliminal Kid as soloist. In 2015, De Ritis; “Melody for Peace” was performed as part of UNESCO’s 70th Anniversary celebrations by the Prague Concert Philharmonic in Paris, and his work “Amsterdam” was presented by the Hong Kong Philharmonic at the Grand Hall at the University of Hong Kong. De Ritis also works frequently with Chinese traditional instruments, including works for pipa virtuosi Min Xiao-Fen and Wu Man. In Fall 2011 De Ritis was as Fulbright Senior Research Scholar at the Central Conservatory of Music in Beijing, China; and in November 2016 was appointed as a Special Professor of the Beijing Advanced Innovation Center at the China Conservatory of Music. De Ritis completed his Ph.D. in Music Composition at the University of California, Berkeley, where he studied with Richard Felciano and Jorge Liderman, and served three years as a teaching assistant to David Wessel at Berkeley’s Center for New Music and Audio Technologies (CNMAT) (1992-1997). He received his M.M. in Electronic Music Composition from Ohio University under Mark Phillips (1990-1992) and his B.A. in Music with a concentration in Business Administration from Bucknell University, studying composition under William Duckworth, Jackson Hill and Kyle Gann, and philosophy with Richard Fleming (1986-1990). De Ritis engaged in summer study at the American Conservatory in Fontainebleau, France under Phillipe Manoury, Tristan Murail, and Gilbert Amy (1991, 1992), the University of Southern California (1990) and New York University (1989). De Ritis also holds a Masters in Business Administration with an emphasis in high-tech from Northeastern University (2002), and in 2006 was named the Alumnus of the Year for the College of Fine Arts at Ohio University. Described as a “genuinely American composer” by Gramophone, Anthony Paul De Ritis is Professor and former Chair of the Music Department in the College of Arts, Media and Design at Northeastern University in Boston, with courtesy appointments in the Entrepreneurship and Innovation Group within the D’Amore-McKim School of Business, and in Asian Studies within the College of Social Sciences and the Humanities. His music has been called “groundbreaking,” “ultra-exotic,” and “really cool,” and has received performances nationally and internationally, including at the Weill Recital Hall at Carnegie Hall, Merkin Hall, Le Poisson Rouge, Avery Fisher Hall at Lincoln Center, Harvard’s Sanders Theatre, Yale’s Woolsey Hall, Taipei’s Zhong Shan Hall, Beijing’s Yugong Yishan, Seoul’s KT Art Hall, the Italian Pavilion at the 2015 World Expo in Milan, and UNESCO headquarters in Paris. De Ritis’ CD, Devolution, described as a “tour de force” by Gramophone, was released in June 2012 by the 6-time Grammy nominated Boston Modern Orchestra Project (BMOP) — Musical America’s 2016 “Ensemble of the Year” — under the baton of Gil Rose. Devolution was the WQXR Q2 “Album of the Week” for June 11, 2012, and features three of De Ritis’ symphonic works, Chords of Dust, Legerdemain, and Devolution: a Concerto for DJ and Symphony Orchestra featuring Paul D. Miller aka DJ Spooky That Subliminal Kid as soloist. De Ritis’ second CD with BMOP, Pop Concerto, was released in February 2017, and features world-renowned guitarist, Eliot Fisk, in four arrangements of songs by Seal, Alanis Morissette, U2, and Michael Jackson, crafted as a Concerto for Guitar and Orchestra. Additional works include Riflessioni for solo bassoon, orchestra, and electronics, written for Patrick de Ritis (no direct blood relation), principal bassoonist of the Wiener Symphoniker; Ballet for chamber orchestra and two pianos featuring Vicky Chow (currently with Bang On A Can) and Dutch pianist, Saskia Lankhoorn, who together go by Duo X88; and Amsterdam, commissioned by Maestro Jung-Ho Pak for the World Youth Symphony Orchestra’s final performance of the Interlochen Center for the Arts 2004 season. De Ritis often works with Chinese traditional instruments. In October 2016 the Central Conservatory of Music in Beijing, China, where De Ritis was a Fulbright Senior Research Scholar in Fall 2011, published his Selected Works for Pipa featuring compositions premiered by pipa virtuosi Min Xiao-Fen, Wu Man, and Yu Yuanchun. De Ritis frequently offers lectures and master classes at Beijing’s Central Conservaory, the China Conservatory of Music (where he was appointed as “Special Professor” of the Beijing Advanced Innovation Center in November 2016), the Communication University of China, and at Tsinghua University’s new x-Lab within the School of Economics and Management. De Ritis completed his Ph.D. in Music Composition at the University of California, Berkeley, where he studied with Richard Felciano and Jorge Liderman, and served three years as a teaching assistant to David Wessel at Berkeley’s Center for New Music and Audio Technologies (CNMAT) (1992-1997). He received his M.M. in Electronic Music Composition from Ohio University under Mark Phillips (1990-1992) and his B.A. in Music with a concentration in Business Administration from Bucknell University, studying composition under William Duckworth, Jackson Hill and Kyle Gann, and philosophy with Richard Fleming (1986-1990). De Ritis engaged in summer study at the American Conservatory in Fontainebleau, France under Phillipe Manoury, Tristan Murail, and Gilbert Amy (1991, 1992), the University of Southern California (1990) and New York University (1989); and holds a Masters in Business Administration with an emphasis in high-tech from Northeastern University (2002). In 2006 De Ritis received the Distinguished Alumni Award by the College of Fine Arts at Ohio University.